The CTEK Charger, MUS 4.3 (Part No. 56-864) is a charger that offers state of the art technology that was previously only found in CTEK’s professional product range. The charger can solve a broad range of battery-related problems and is the perfect charger for those with high demands. The MUS 4.3 offers features such as battery diagnosis that shows if a battery can receive and retain a charge, a special reconditioning function that restores stratified and deeply discharged batteries, unique maintenance charging, a mode for optimized charging during cold winter days and the charging of demanding AGM batteries (i.e. Optima). The unique display allows the user to follow the entire charging process. 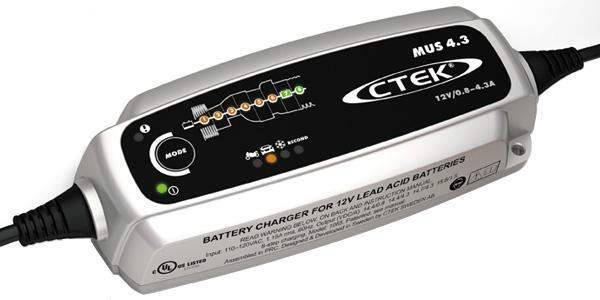 The CTEK Charger, MUS 4.3 is a fully automatic 8-step charger that delivers selectable 0.8 A or 4.3 A to 12 V batteries from 1.2–110 Ah and is suitable for maintenance charging up to 160 Ah. The charger is splash and dust proof, designed to protect vehicle electronics and non-sparking, reverse polarity protected and short-circuit proof. It is delivered with a 5-year warranty.